Vilasini Balakrishnan, of Chinmaya Mission Washington Regional Center (CMWRC), spent her teen years questing for the meaning of life, and found her answer in India during her Junior semester abroad as a comparative philosophy student. The greatest fortune of her life was meeting Swami Chinmayananda and beginning her Vedanta sadhana in 1975. 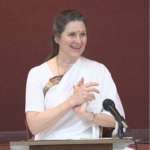 She graduated from Tufts with a B.S in philosophy, and in 1978, she graduated from the Mission’s two-year Vedanta course at Sandeepany Sadhanalaya in Mumbai. 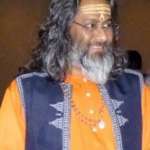 Vilasiniji and her family organized Pujya Gurudev’s first Jnana Yajna and Study Group in Washington D.C. in 1978. Until 1981, Vilasiniji served Chinmaya Mission in Flint, Chicago, Boston, and Bay Area, where she taught Vedanta, Bala Vihar, and Study Groups. From 1981 to 1984, Vilasiniji had the great blessing to serve as Pujya Gurudev’s secretary, traveling with Gurudev to all his yajnas, videotaping his talks, and performing secretarial duties. In 1984, she was assigned as Editor of CMW’s (Chinmaya Mission West) Mananam series. In 1986, Vilasiniji and her husband Suresh moved back to Washington, DC. Both were founding members of CMWRC. Gurudev also placed Vilasiniji on CMW’s Board of Directors and later appointed her as CMW’s Executive Secretary. Vilasiniji became a licensed professional counselor and practices family and marriage counseling, in addition to teaching Vedanta classes for adults and serving as CMWRC’s Regional Bala Vihar Director. She loves teaching meditation and also Yoga Nidra to adults as well as youth. Her Spiritual Parenting workshops are extremely popular. People say of Vilasiniji, “She is always smiling, just as Gurudev tells us to Keep Smiling.” She brings a natural wisdom and compassion to her classes and loves sharing with people the Science of Happiness that is Vedanta.